Blog ICBC Woes: Can I Blame my Dog for the Accident if he Pushes my Seat from Behind? ICBC Woes: Can I Blame my Dog for the Accident if he Pushes my Seat from Behind? Dog owners know that dogs in cars can act unpredictably. One moment the dog is calmly enjoying the wind in his fur, the next he is trying to leap out the driver’s side window. The courts have found that if it is foreseeable that the dog may interfere with the driver, then there is a duty to properly restrain the dog. In my opinion, the defendant’s explanation falls far short of establishing that there was no negligence on her part. Her evidence fails to establish that she could not have avoided the accident by the exercise of reasonable skill or care. I have reached that conclusion for a number of reasons. 1. Mrs. Hodgkinson had in her “control” a 16-month-old dog. 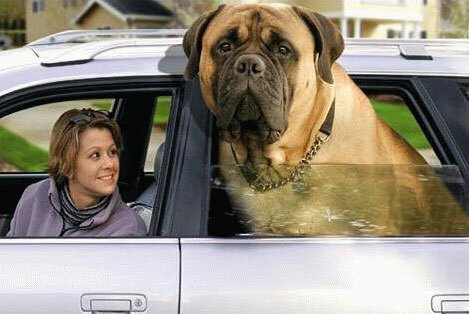 She did not take adequate steps to see that the large, young and playful dog was properly secured so that it would not interfere with her driving. 2. The dog had been away from home for a number of days and had just been reunited with its family. The circumstances of the day, the size and youth of the dog, taken together, should have been fair warning that the dog’s behaviour would at least be unpredictable. 3. The dog was placed in the back seat behind Mrs. Hodgkinson. She was aware that it needed to be secured in some manner for the dog was placed on a leash and was wrapped twice around her son’s hand. Although Mrs. Hodgkinson apparently foresaw the risk of danger from the movements of the dog by her use of the leash and the double wrapping of the leash around her son’s hand, those steps were totally inadequate to control the dog. No attempt was made to fasten the leash to a portion of the car so that the dog could not interfere with the driver. 4. Her son (at seven years of age), weighing the same as the dog, could not possibly have exercised any control if the dog moved quickly. 5. The potentially dangerous situation was exacerbated by Mrs. Hodgkinson opening the window beside her when she was aware that her dog enjoyed a flow of air when it was riding in the car. It could scarcely come as a surprise if the dog put his nose to the open window. 6. Mrs. Hodgkinson, after she had created the dangerous situation within her car, proceeded to compound the problem by driving on a four-lane highway at a time when she kenw that traffic would be heavy. Whether or not the actions of a dog may excuse the actions of the driver of the rear car in situations such as this will depend upon a number of factors including the size, weight, age, temperament and past behaviour of the dog, the degree of control exercised over the dog, the route to be followed by the driver, the speeds at which the driver is expected to drive, the conditions under which the driver would be expected to drive and the amount of traffic he may be expected to encounter. Need a BC accident lawyer? Call us.